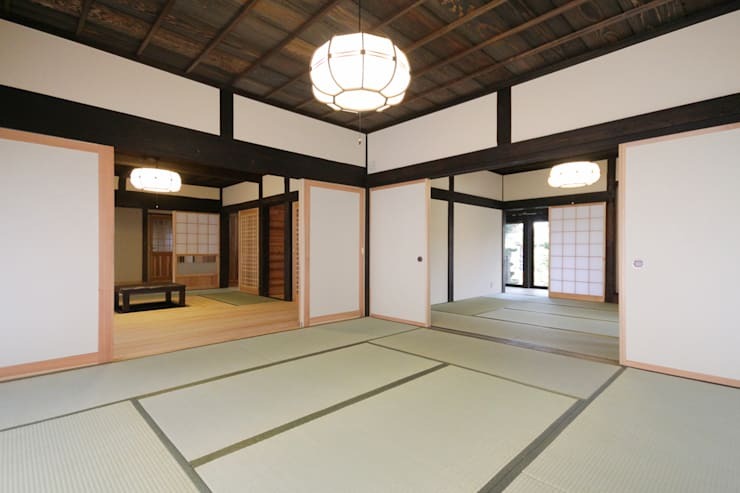 The timeless elegance of Japanese design is stunning to behold when successfully manifested within a house or apartment. The following home presents a prime example of this minimalistic aesthetic, with the creatives at Iezukuri Architects having designed and constructed a beautiful abode, expansive enough to house a budding family. From the outset the home presents a classic facade, with a sparsely populated garden cradling the strong, stoic lines and cascading, tiled roof of a traditionally design house. Inside the dwelling is simple and spacious, with paper walls and sliding doors partitioning large living areas, allowing the interior to be sectioned off or opened up at will. The home's kitchen is understated, with its simple finishes and colour scheme surrounded by the striking lines of dark, wooden beams and the contrasting tones of the timber constructing the flooring and latticed screens. Moving through to the rear and a spacious hallway leads to wholly retractable glass, sliding doors, providing access to the back garden and further adding to the open functionality of the dwelling. This house is extraordinary in its classic, serene style. Take a tour below and feel its soothing atmosphere wash over you, then tell us what you think! The exterior of the home is streamlined and serene, evoking elements of both classic and contemporary design. The cool grey of the roofing is actually sunlight reflected from its sleek, black finish, with extraordinary attention to detail evident in the placement of its sloping tiles. The garden is sparse and traditional, with the crooked trunk and sculpted boughs of a maturing tree central within the space, in keeping with aesthetic of classic Japanese horticulture. 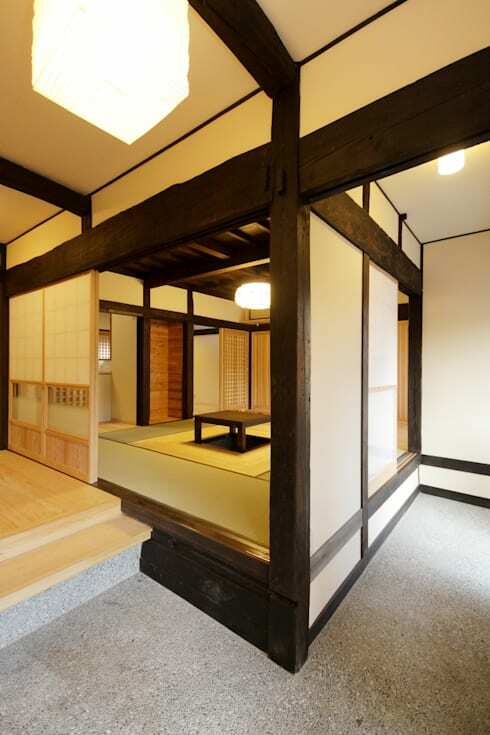 Through expansive, front windows we can glimpse the expansive interior of the home, in which the elegant simplicity of Japanese architecture has been beautifully showcased. 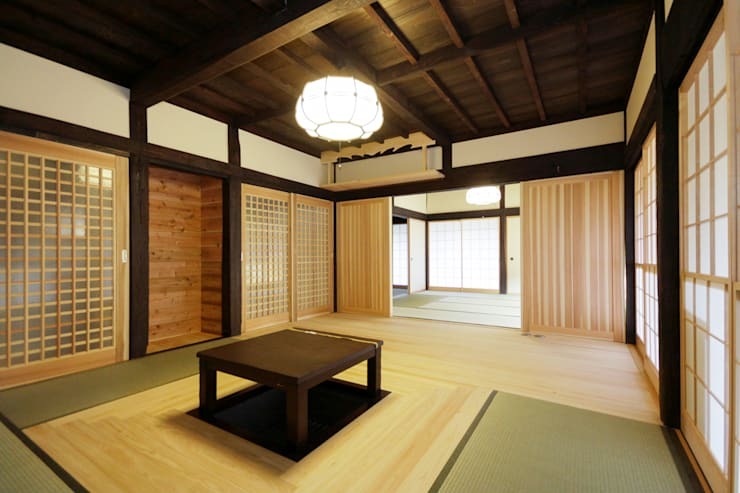 The interior of the home is characterised by strong lines and large rooms, with traditional, paper walls and partitions used to delineate each space. Dark, wooden beams flow throughout, with the criss-cross of horizontal and vertical lines creating a striking, linear maze. Contrasting textures and colours are also prevalent, with a range of wooden finishes having been used to create the delicate frames for the paper partitions as well as the flooring and furnishings. This living space perfectly illustrates the clever combination of wooden finished the designers have used to add character and contrast within the home. The lines of woodgrain flow in all directions, infusing the room with an atmosphere that is both streamlined and subtly busy. The dark tones of the wooden ceiling contrast beautifully with the pale timber of the floor, which itself is softened by flowing, green carpets. In the centre of the space rests a simple, low-lying table, with the minimalistic scene evoking a soothing serenity. This room presents a contrasting design, with the softer finish of green carpets chosen in favour of the pale timber of its predecessor. The dark ceiling flows above with strength and stoicism, with the classic, round light providing warm illumination. 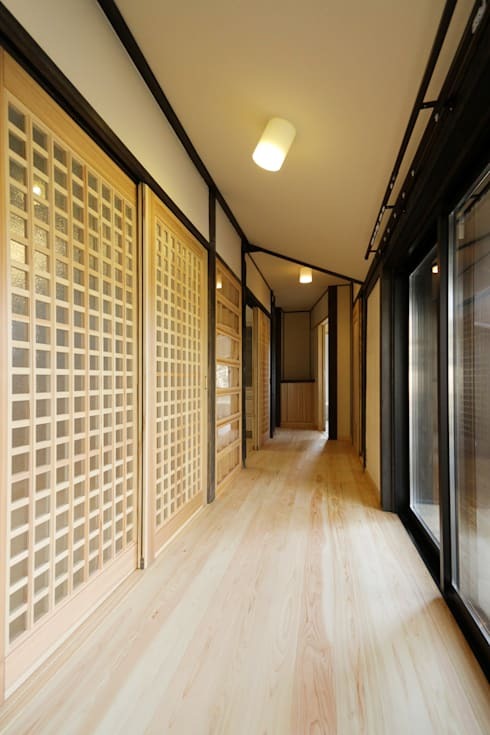 Here we can see that the rooms within the home can be easily opened and amalgamated through the use of a series of light, paper screens, adding another layer of functionality and flexibility throughout the house. The kitchen is cosy and contemporary, with the simple finishes of its sink and storage units presenting a subdued space. 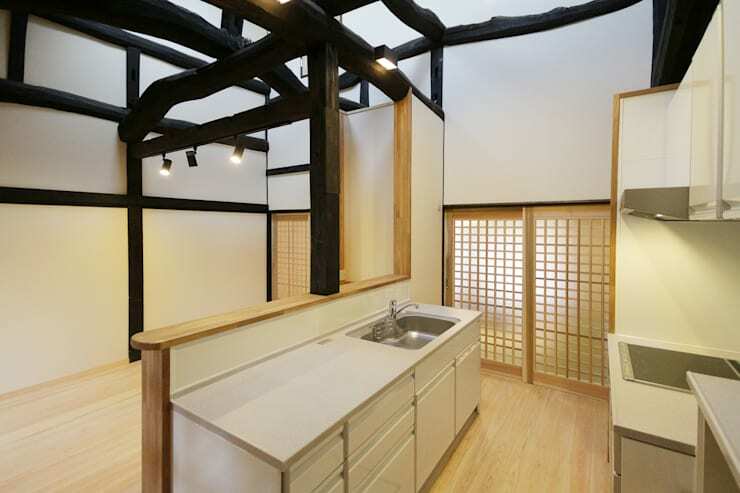 Pale timber streams around it in the floors and partitions, while white walls flow upward to an array of strong, rustic wooden beams. The gnarled, imperfect finish of the beams adds an interesting contrast to the clean lines and smooth surfaces of the kitchen, with the beams almost seeming to take on a life of their own as they slither and write across the ceiling. 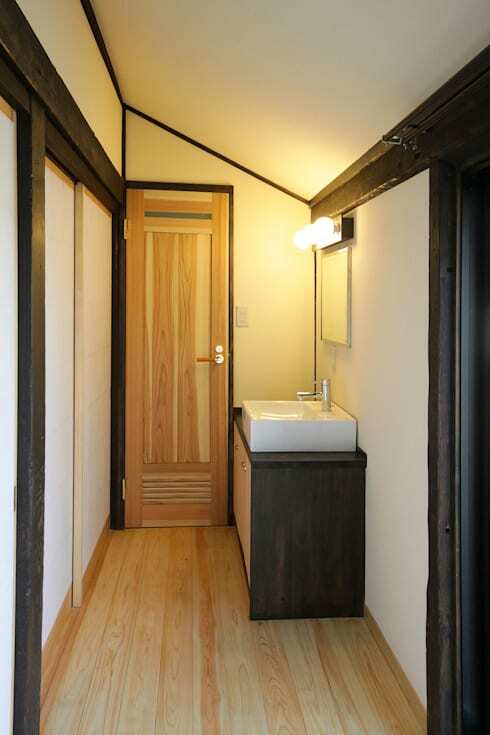 The bathroom is also understated, with contrasting wooden finishes augmenting the simple design of the space. Seen here is a contemporary sink unit with wooden storage cabinet waiting to accommodate the privacy of bathroom rituals. The strong lines of painted, black wood frame the space, with the white walls creating a sense of expansion and the paler timber contributing to a warm, calm atmosphere. This view of the transitive area of the home truly gives a sense of the streamlined and spacious atmosphere that has been created. The flowing lines of the floorboards and the impressive craftsmanship of the latticed partitions are resplendent in their minimalistic style, while the cool black lines of timber and metal frame the space. Expansive, glass sliding doors provide a portal to the back yard, and can be opened to allow light and air to circulate throughout in good weather, further adding to the abode's soothing, serene atmosphere. For more ideas about minimalist design in action have a look at The Minimalist Triangle Home! 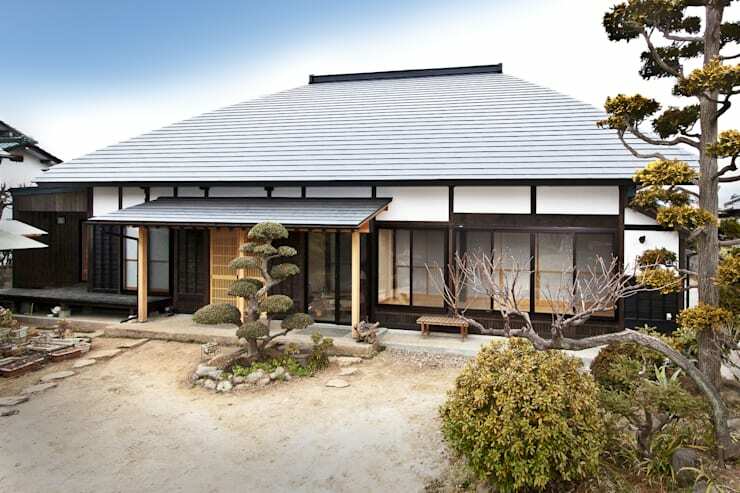 Do you have any questions about this open and expansive Japanese home? Let us know below!